Guess what? The Volunteer Appreciation Month fun continues! Today’s celebration? National Girl Scout Leader's Day! Every year on April 22, we take the time to honor all the amazing Girl Scout volunteers who selflessly lead and mentor girls in big, powerful ways all year long. Yes, we’re talking to you Girl Scout Leader. You’re so AWESOME, and we appreciate you! And the girls you serve? They LOVE you! So let’s celebrate, shall we? Here are some of our favorite responses that show the essence of the meaningful, inspiring work Girl Scout Leaders do every day. Ready? Let’s do it! 1. “She can lead. She can be led. She can work hard. She can fix. She can do. She can make things better.” – Kelsey B. 2. “She sold cookies. My daughter has dyspraxia of speech and didn't speak at 3. At 6, as a cookie rookie this year, she had the confidence to sell 500+ boxes of cookies.” – Erin S.
3. “She is asking for help and helping other children, especially those that are younger than her. She knows being a girl is awesome and she can do anything.” – Allison J. 4. “She isn’t afraid to try new things!” – Laura M.
5. “She is becoming more generous and actively looks for opportunities to help and include others.” – Sarah C.
6. “She sees compassion as strength.” – Rachel E.
7. “She's able to see herself as more than ‘just a girl.’ Girl scouts has provided a way for girls to see that they're the next generation of engineers, scientists, and foresters.” – Elizabeth M.
8. “She is no longer afraid to be herself or feel the need to hide behind stereotypes. Instead she can break down gender regulations not only while scouting, but in everyday life.” – Caitie B. 9. “She is invincible.” – Karen R.
Impressive right? We think so! And hey, the month isn’t over yet, and neither is our celebration. 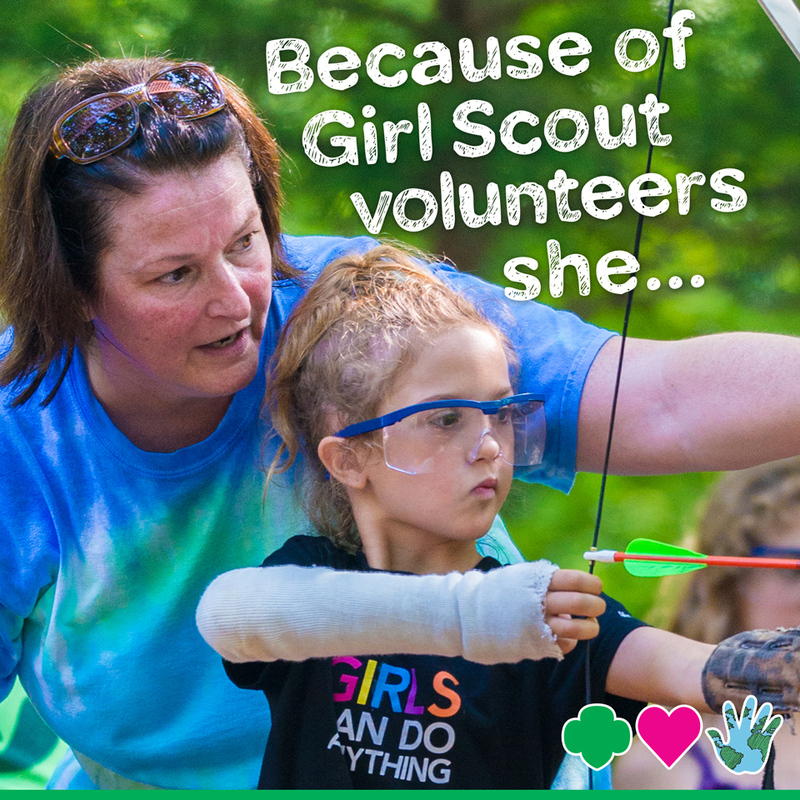 Make sure to continue to share the awesome things a Girl Scout Leader has made possible for a girl in your life! Facebook, Twitter, Instagram, and our eyes and ears eagerly await it all! Don’t forget to use the hashtag #NVM2016, and follow the conversation. Want to change girls’ lives by becoming a Girl Scout Leader? Sign up now at girlscouts.org/volunteer. Happy National Girl Scout Leader's Day!